The Red Nintendo Wii was released in November 2010, and sold until December 31st, 2010, making this the rarest Wii console. It was sold with New Super Mario Bros. Wii, Wii Sports, and a red Wii Remote Plus/Nunchuk combo. The value of these Wii's are skyrocketing since January 2011. They now have a value of $300.00 to $400.00. It was made to celebrate the 25th year of Super Mario Bros. 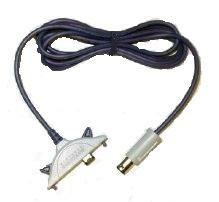 This cord is very rare, because few were made because of the small amount of games made for it.